Here in the West Palm Beach area, the sun’s rays can be very powerful all year round. To protect what’s inside your home from the sun, while still maintaining your view and letting in light, we recommend solar screen shades. If you’re concerned about style, don’t be. Designer Screen Shades from Hunter Douglas are available in over 38 stylish material and color combinations. Stop by our gallery store to see full-size displays of our shade selection and view the variety of styles available. Variety of design options to ensure they complement any decor. Roller shade construction gives them a low profile with fabric that easily rolls up and down, taking up very little window space when installed. Fits windows up to 192 inches wide and 144 inches high. Works for French doors and sliding glass doors too! 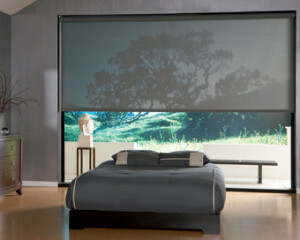 Both residential and commercial customers enjoy the style and function of screen shades. For residential customers, screen shades are perfect for kitchens and living areas where natural light is welcome but needs to be muted without reducing the view. Screen shades are also popular for commercial customers such as office buildings or restaurants. The most common lifting system for roller screen shades is standard clutch system with a continuous cord loop. Pulling gently on the cord causes the clutch to rotate the metal roller tube, which raises or lowers the shade and holds it in place. For enhanced child and pet safety, cordless lifting systems that use the bottom bar or decorative pulls for operation are also available for screen shades. Motorized lifting systems are gaining in popularity for screen shades. We offer the PowerRise 2.0 with Platinum Technology motorized system that allows customers to operate their screen shades with a touch of a button or through the innovative Platinum App for use with Apple mobile devices.